Whether we admit it or not we are living in an era where a tremendous accent is put on the way we dress and the way we look. Having a proper sense of fashion and impeccable style says a lot about a person not only in women`s fashion but in men`s fashion too. “Owning” the way you dress can affect how people treat you and approach you. Surprisingly your future too might be depending on the way you dress. The proper kind of style can have a huge impact on your career or future prosperity in the company that you work for. Yes, you can even “earn” a promotion due to your impeccable style. Showing that you are committed to details is a great way to prove that you are always willing to go the extra mile and put your best foot forward! An extra mile to look flawless, an extra mile to please your clients, an extra mile to watch the company gradually grow and develop. Not only when it comes to showing your true bold personality at work but in your personal life too, you will notice that the perfect style is literally a magnet for the ladies. They will always choose the stylish and fashion-forward man over the sloppy dressed one. Once you change the way you dress, you will be able shortly after to notice all the looks on the streets. It is a good thing, and you should own it! Setting the bar high among men will definitely set you apart from the crowd. Now that you have seen how investing in proper business attire and personal one can literally change and significantly improve your life there are additional “do's” and “don'ts” you need to follow too, to become an example of how a man should indeed look. As we all know the devil is in the details so do take the time to read the following information that will separate you and make you stand out from the crowd. We are starting with a few tips and tricks on what should you do. Within the core of improving your style and sense of fashion lies making the right decisions. Following the latest trends and purchasing the newest pieces of clothing is simply not enough. You need to get to the bottom of it all and put together a wardrobe for yourself packed with high-quality and timeless pieces. Here are the top things that you should DO. Nevertheless, if you consider yourself a simple and casual man or if you are a businessman that wears a suit on a daily basis, owning one or a number of suits doesn't mean much if they don't fit you right. You could purchase the best and most expensive suit from the softest and the most durable materials but without the proper tailoring, it will look cheap. Simple as that. Looking like the suit was sawn for you and your body type can be achieved only by making a visit to a professional tailor. Making some changes to both the jacket and the trousers will provide you with much more polished and elegant look, your waist will look slimmer, your lines leaner and longer, and your shoulders will look wider. So don’t even hesitate nor delay since tailoring can truly “make or break” your overall look. If you are in the search for a piece of clothing that will go well both in casual and in semi-formal occasions then purchasing a pair of slim fit jeans is just the thing that you are looking for. You will become obsessed with their versatility and practicality and even additionally they are considered to be one of the most fashionable pieces of clothing today. They will literally hug your body and show your figure off in the best way possible. Just be careful with the size and their cut, there is a thin line between perfectly fitting and too tight, after all, you don’t want to look like you are wearing leggings. Nothing screams fashion yet simplicity and elegance at the same time as the casual combination of jeans plus a sports coat. Suitable for a number of occasions such as walk in the park, coffee with the friends, running some errands, and going out for a drink. Use your imagination to create interesting and creative combinations. Wear simple and fitted jeans together with an unusual pleated sports jacket, or maybe experiment with the fabric and choose tweed or corduroy. The sports jacket mustn’t be worn only with a shirt but it can be worn with sweaters, casual printed shirts, or turtlenecks for the chilly autumn days. You can never go wrong by purchasing high-quality shoes. You should automatically see them as an investment rather than like an unnecessary expense. They are the pinnacle to one`s combination and a reflection of who you are as a person. When you are all suit up you should wear more formal shoes such as the Oxfords and for semi-formal events with your favorite pair of jeans, you can go with more casual footwear such as loafers or ankle boots. This is an almost actual rule known around the world between gents that are constantly paying attention to details. Matching your shoes to your belt is a great way to show your top-notch style. If you are wearing a classic and super formal suit with some black shoes consider purchasing black belt too and if you are aiming to create more casual combination by wearing some neutral colored shoes than you should buy the same colored belt. Not only their color but their material and texture should be matching too. Probably the easiest way to create the seamless combination is to purchase both of the items at the same time. Some brands even make it easy on you by creating a collection of belts and dress shoes that were made to be worn together. 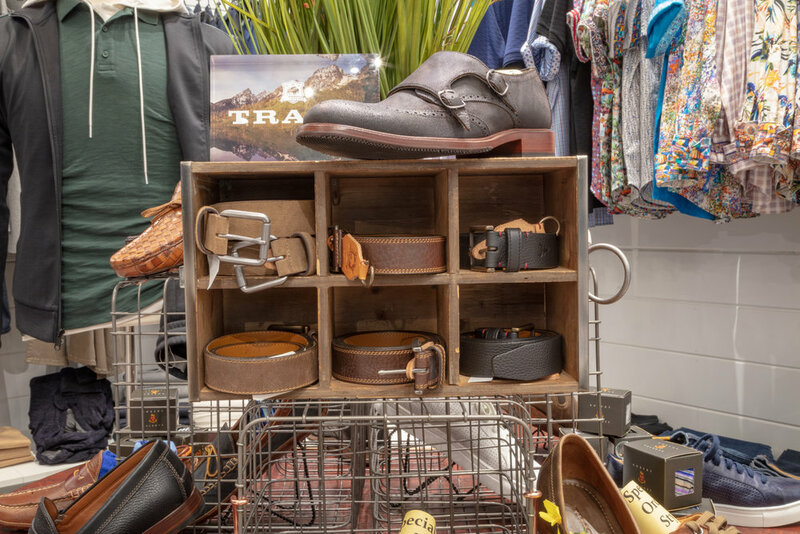 Trask, is one of our best selling brands that carries a selection of shoes and belts that already match. If you are not feeling like yourself when wearing a suit, don't despair, there is always a solution. One way to add character to your overall combination is to add patterns and prints. Don’t be afraid to experiment and leave your comfort zone where you combine only one or two neutral and basic colors. Try to include polka dots, interesting patterns, pleated patterns, stripes, some flowers, etc. Let your imagination run wild. If you don’t want to go with prints and patterns on major parts such as the jacket or the shirt, try making your accessories interesting. Wearing a bow tie is a subtle way to show how cool you are. Yes, besides being the perfect elegant companion to a tuxedo, they are also the ideal place to add a certain pattern or print. The creativity goes beyond imagination when certain companies invented even wooden bow ties. They will up your tie “game” to a completely new level. Give it a try, they might just surprise you. As much as you need to pay attention to what you should do in terms of making improvements to your style, there are certain things that you know you need to avoid. Because even if you embrace all of the style trends above and then incorporate any of these horrible style trends below, you automatically lose all credibility. When you are going shopping, the first and most important thing you need to stop doing is purchasing clothes that don’t fit you right. It doesn’t matter how much you like the way it looks, or its pattern, or its print…leave it in the store. Buying clothes that don’t necessarily enhance and emphasize the best parts of your body will leave your wallet empty, and what`s even worse when you realize there is no use from that piece of clothing - you are left empty handed too. Although we all like to spoil ourselves, be careful, a childish game can easily turn into a debt. Yes, visiting the nearby mall to purchase a tie or a pair of jeans can turn into a nightmare when you realize that you have bought a number of unnecessary clothing pieces. Easily driven by the loud music, the “spending” atmosphere, and the fake discounts you will find yourself entrapped in the consuming chain. Wearing stylish clothes shouldn’t mean making a dent in your budget. Yes, when you will have more, you will spend more but right now prioritize quality over quantity. As we all know it, part of who we are is the way that we dress, or even better said, the way we dress is a reflection of who we truly are. It is a way to show our true colors and what lies within us. Do you consider yourself a fun, outgoing, adventurous, and courageous person? If so why not reflect it, radiate it, show it to the word. There is not a simpler and easier way than through your clothes. No one can be you and that is your strength so you might as well use it! Sometimes you can spend hours into choosing the perfect clothes or figuring out what to wear but it all means nothing if you leave your home with wrinkled clothing. Something so small can have a tremendous impact especially if you are leaving to go to work, or for an important business meeting. Not only ironing your clothes but also hanging them properly will save you from trouble or from making the wrong impression. As we previously mentioned, owning a pair of jeans that fit you like a glove will save you in a number of situations when you need to create a casual yet fashionable combination. On the other hand, you need to throw away your high school embellished or baggy jeans. Back then when you were discovering yourself and what you want to wear, a bling on the front pocket was ultra-stylish, but not anymore. We can say the same thing about the baggy jeans, they make you look sloppy, and like you are short-they visually shorten your legs. Plus you must admit that your underwear being visible is not such nice sight to be seen. Just think about it, why would you? Sandals are summer appropriate footwear and wearing them with socks is an absolute NO! You want to feel comfortable but pay attention to aesthetics too. It makes no sense pairing them. No matter what are you wearing or how well you are dressed, you will ruin your overall combination. As we mentioned, the footwear is a super important piece and they sort off are the finishing touch. Plus, why compromise on your style to feel comfortable and vice versa, when you can have both of them. Nowadays, we have tons and tons of footwear options to choose from. Spending tons of money on specifically designed, worldly-famous, and branded clothes doesn’t actually mean that they will look good on you. Do not purchase something just for the label, but make sure they fit you well, they are made with high quality fabric and they are worth the cost. It is okay to sport a designer label every once awhile, but it’s not a good look to be “that guy” that only wears designers, but not only that, he wants the whole world to know. Blaine’s is a high-end men’s clothing store, so you better believe we are all about supporting designer quality, however we believe the clothing can speak for itself. If it is truly designer quality, and style, you will know it without even seeing a label. Even though we are here to help you and guide you with meticulously selected tips and tricks of what you should and shouldn’t DO, at the end of the day, you don’t have to spend a ridiculous amount of money just to be stylish. Figure out a monthly budget for shopping and purchase things that fit you well and are crafted from fine materials. Although, you should be careful about mixing and matching the prints and additionally the colors that you wear, once in a while don’t be scared to experiment with something new. After all, you never know, you might end up discovering something that works perfectly for you and your body type. And last but not least important, don’t forget to be yourself and show it through the clothes that you are wearing on daily basis. At Blaine’s Fine Men’s Apparel you will not only find the finest selection of suits, dress shirts, and pairs of shoes manufactured from 100% genuine leather, we will also make sure you leave our store educated and well-informed about timeless tricks that will take your style to perfection.